Mega Sale! Free Shipping Included! Save 26% on the LED Grow Light for Indoor Plants,YGROW Upgraded 75W Growing Lamp Light Bulbs with Exclusive Full Spectrum for Greenhouse Hydroponic Plants from Seeding to Harvest by YGROW at Aquaponics In Paradise. Hurry! Limited time offer. Offer valid only while supplies last. YGROW 75W LED Grow Light is the most cost-effective grow light when compare to other high wattage and expensive grow lights for your planting. YGROW 75W LED Grow Light is the most cost-effective grow light when compare to other high wattage and expensive grow lights for your planting. Designed with exclusive spectrum, low heat control and high PPFD,which can provide all useful light for plant needed and enjoy the harvest all year around. ▲Grow Anything You Want with This Growing Light. Our plant growing light can be used for both hydroponics and plants in soil, such as tomatoes, potatoes, pepper, lettuce, etc. Suitable for all indoor growing environment: grow tent, grow room, etc. 1.All kinds of flower plants:Special indoor plant,tomatoes,eggplant,rose,ect. 2.All kinds of greens:Herbs and leafy vegetables,lettuces,bok,choy,ect. 3.Also suitable for indoor garden or indoor potted landscape. ▲Get Your Harvest with YGROW 75W. 1.Exclusive spectrum provide all the major light for your plants grow healthy all year around. RED(630,660nm) and BLUE(470nm) promote the synthesis of chlorophyll and carotenoids, help leaf growth and best for flowering and fruiting plants.UV light (410nm) promote seeding and sterilization. 2.High efficiency and performance: We have tested under our grow light the plants grew faster and more leaves popped up with only 1 week,plants are profuse in growth within 7-10 days under this light,take care of all stages of plant. ✔Premium quality & reliable technology. 1 year warranty and 30 days money back. If your products have any problem, please feel free to contact us via Amazon message. We will give you the best solution according to your exact problems. 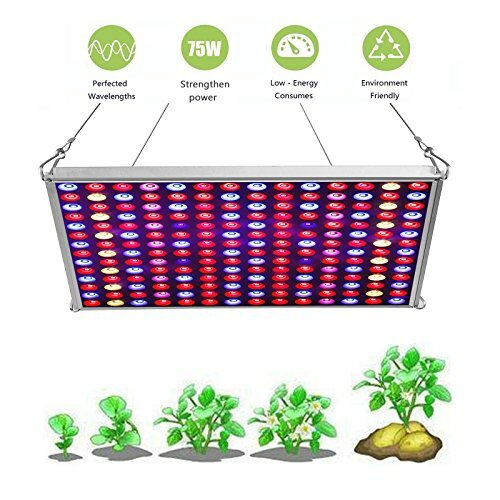 ►UPGRADED 75W GROW LIGHT.◄This growing lamp upgraded with more professional spectrum with UV and large effective illumination area,luminous efficiency reach up to 98% without any waste.Efficiently shorten the growth cycle, provide anti-season plants, veg and flowers, also increase the yield to great degree. With YGROW full spectrum grow light, you can growing any plants you want in a year around,include anti-season plants,suitable for all kinds of plants growing. ►OPTIMAL SPECTRUM.◄ We did lots of experimentation to ensure that this full spectrum design promotes plant growth. It includes universal Blue Red and UV and white light provide everything plant desire in the natural sunlight.Moreover,our 75w led grow light added more blue and red led,which is essential light for all kinds of plants grow from seeding to harvest. ►EFFICIENTLY ENERGY SAVING.◄ Ultra-low heat output. This plant light adopt aluminum heat back panel, plus a small heat sink for each chip to achieve excellent heat dissipation.Integrated main board and dual power supply make it more durable than others. No fans and good heat dissipation save your electric bill a lot. ►MOST WORTH--INCREASE 40% YIELD◄Equal to traditional 150 watt HPS/MH while consuming only 30w. It is recommended to cover an area of 17.7"x27.6" to 27.6"x35.4" and be hung at around 11.8" - 23.6"according to different growing stage of your plants.Upgraded larger reflector cup design plus high anti crystal reflective material ensure high light efficiency for better growth. ►EASY TO USE.◄ Include 4 stainless Hanging kit,you can hang this grow light for anywhere you want. It can be used for both hydroponics and indoor plants in soil, such as orchid, potatoes, lettuce, Bonsai Trees, peppers, chili, tomatoes, aquarium plants like algae that in greenhouse, garden,balcony, kitchen, vertical farm, grow tent or grow room. If you have any questions about this product by YGROW, contact us by completing and submitting the form below. If you are looking for a specif part number, please include it with your message.